A diagram of effects illustrating the first two loops of the three loops of the Restructuring-Fear Cycle described here. View a larger image. The turquoise ovals represent quantitative amounts. For example, the oval labeled "Need for Restructuring" represents the perceived need for a restructuring event. The oval labeled "Credibility of Reports" represents the perceived credibility of reports about work underway in an organization in which people fear the consequences of reporting bad news honestly, or fear the consequences of failing to report good news with sufficient frequency. An arrow connecting one oval to another indicates that an increase in the first quantity contributes to an increase in the quantity it points to. Thus, an increase in Credibility of Reports contributes to an increase in Management Effectiveness. An arrow bearing a red circle indicates a negative relationship. Thus, an increase in Withholding Bad News contributes to a decrease in Credibility of Reports. If any loop of this diagram contains an even number of red circles, such as 0, 2, 4, and so on, then it rerpresents a positive feedback loop, and the quantities in that loop can "run away" unless Management (or the laws of economics, psychology, or physics) somehow intervene. This diagram, which illustrates only some of the phenomena affecting the Need for Restructuring, shows that there are two pathways that can cause a runaway need for restructuring. The two loops shown correspond to Credibility Erosion and Getting Things in Under the Wire. Left as an exercise for you is the third mechanism, Roster Padding. 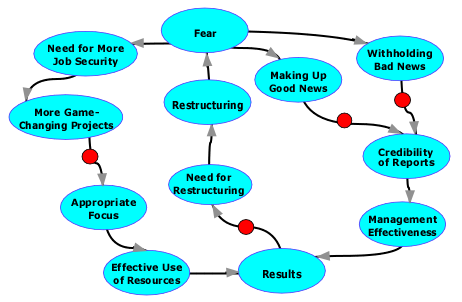 Last time we began exploring the Restructuring-Fear Cycle, which shows how the fear induced by restructuring can create a need for more restructuring. In effect, organizations can become addicted to restructuring. Here's Part II of our exploration. When employees notice a pattern of restructuring, many assume that their own performance, and that of their business unit, will affect decisions about their job security. Correct or not, this speculation can lead to withholding bad news, or worse, creating fictitious good news. As status reports travel up the management chain, some recipients, anticipating this shading of the truth, doubt the veracity of the reports. When what we say to each other becomes unreliable, managing the organization becomes truly difficult. Enterprise performance is at risk. In this way, restructuring events can degrade enterprise performance, which increases the need for further restructuring. Top-to-bottom management replacement, as in a spin-off or acquisition, is sometimes the only way to end this cycle. Among managers who recognize that further restructuring lies ahead are those who undertake so-called game-changing projects that promise a brighter future. They're hoping, in part, to enhance their own job security. Because they typically believe that the opportunity for initiating new projects is short-lived, they tend to oversell the attractiveness of their initiatives by representing them as better developed, lower-risk, more important, and more urgent than they really are. This dynamic can lead the enterprise to undertake too many new efforts, many of them too disconnected from its core mission. The problems inherent in development are often understated, and the downstream costs of supporting new offerings are often underestimated. Many of these efforts come to nothing. The resources invested are wasted, which leads to enhanced necessity for further restructuring. promise a brighter futureenterprises, we can usually find a most-politically-powerful entity — a brand, a business unit, or a constellation of smaller entities exploiting a single market position. To employees who fear job loss as a consequence of restructuring, the most-politically-powerful elements seem like possible havens of job security. Managers within the politically powerful elements thus sometimes experience a flux of jobs seekers from other business units. Before the restructuring began, some of these people would not have been obtainable at the rates being offered, or not obtainable at all. Some managers succumb to the temptation to make internal hires. When external hiring is frozen, but internal transfers are still permitted, politically powerful entities can find themselves bloated with employees and projects. Their expenses climb, and soon there is need for yet another round of restructuring. Would you like to see your comments posted here? rbrenAyfOKMJCetdKUoPSner@ChacQVyoKLZKrTQsfRfBoCanyon.comSend me your comments by email, or by Web form. I offer email and telephone coaching at both corporate and individual rates. Contact Rick for details at rbrencrHvZOmgvlmHgJyDner@ChacXExTsCmhdbbxbKHPoCanyon.com or (650) 787-6475, or toll-free in the continental US at (866) 378-5470.